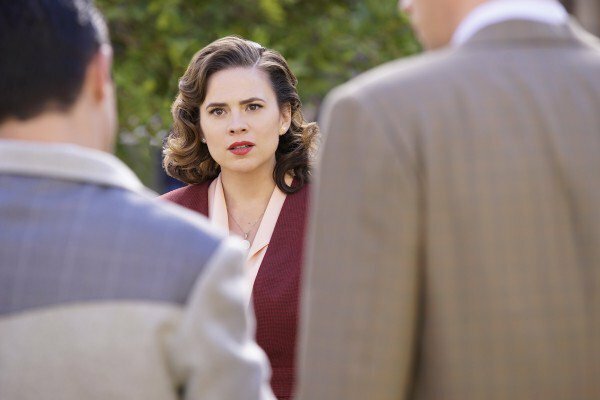 Agent Carter vs Thompson in Season Finale Teaser "Hollywood Ending"
On the exciting Marvel's Agent Carter season 2 finale, "Hollywood Ending," Peggy (Hayley Atwell) needs Howard Stark to eliminate Zero Matter as they are faced with a mission none of them could come back from. In the sneak peeks below, Peggy and Sousa search Whitney Frost's room - thanks to helo from Joseph Manfredi (guest star Ken Marino) - in hopes of finding clues. What will they end up finding? Also, when Thompson refuses to put the detonator down, Peggy threatens him with a gun. He doesn't believe she would do it... will Peggy pull the trigger? Tune in to the all-new Marvel's Agent Carter season finale TUESDAY MAR 1 9|8c!